""Sanctuary Cities" Are NOT Above the Law"
Bring Criminal Charges NOW to elected officials who are blocking federal deportation efforts. Illegal immigration is a matter of law, not charity -- so-called "Sanctuary Cities" protecting law breakers MUST BE STOPPED. 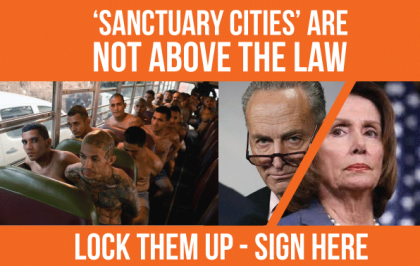 Demand Congress bring criminal charges to so-called "Sanctuary City" politicians who promote illegal immigration and obstruct federal deportation efforts. We cannot allow a few "Sanctuary City" crooksters operate above the law and endanger our families and steal our tax dollars in the process. LOCK THEM UP NOW.